WASHINGTON, D.C., Oct. 3 – Build Change and the World Bank on Wednesday launched a major new initiative aimed at improving the safety and structural integrity of millions of homes in the developing world, many of them built with haphazard materials and informal methods that leave them particularly vulnerable to extreme weather events, earthquakes and other disasters. Speaking in the wake of yet another severe natural disaster, an earthquake and tsunami that devastated Indonesia’s Sulawesi region on September 28, Hausler said an emphasis on prevention rather than reactive response is overdue on the global development agenda given the increasing strength and frequency of natural disasters. The new Global Program for Resilient Housing (GPRH) aims to increase safety and raise awareness of the importance of structural integrity in communities repeatedly subjected to high casualty disasters around the world. Luis Miguel Triveno Chan Jan, a senior urban development specialist at the World Bank, said the new program would for the first time focus the world’s leading development finance institution on improving the safety of existing housing rather than on broader infrastructure projects or new construction initiatives. The point, he said, was saving lives. The GPRH program marks a milestone in the quest to make housing resilience a priority in the global development agenda. Build Change, founded in 2004, is among a handful of organizations that have championed a more preventative approach to natural disasters through its work in at-risk communities. The organization, which began in Indonesia, now trains builders, retrofits homes, provides engineering and design guidance and shapes housing codes and policy on three continents. A good example of Build Change’s positive influence is Colombia, a country particularly susceptible to seismic activity, flooding and landslides. The new government of President Iván Duque Márquez has vowed to improve the integrity of at least 600,000 Colombian dwellings during its four-year tenure. Build Change’s policy and retrofitting work was cited as influential in shaping the new government’s housing policies. “We are not just going to enhance the building of new housing, we want to intervene to ameliorate the condition of existing housing,” said Carlos Felipe Reyes, Housing Policy Director at Colombia’s Ministry of Housing. He said Colombia was convinced, in part because of retrofitting pilot projects that Build Change has conducted with local authorities in Bogota and Medellin, that preventative measures must be given a greater share of the national housing budget. Reyes also said the government understands that flexibility is needed. Strict building codes – perfectly acceptable when applied to new construction or rich, developed nations – currently act as an impediment in many less economically favored jurisdictions to making vital improvements to the structural integrity of existing structures. Dr. Hausler, an engineer whose work as a social entrepreneur has won numerous awards and channeled over $40 million in charitable donations to the cause of housing resilience, said the World Bank initiative would help build on hard-won progress in at the national and local levels in vulnerable countries like Colombia, the Philippines, Haiti, Nepal, and Indonesia. Technology was another topic reviewed at Wednesday’s event. The World Bank presenting results of two pilot programs – one in Bogota, Colombia, one in Guatemala City – using geo-mapping and drone photography to help identify vulnerable housing stock. Using car-mounted cameras similar to those used by Google to map streets in the developed world, technicians then cross referenced the results with drone photography to produce aerial and street-level photographic surveys of these neighborhoods. By merging the two databases and applying Artificial Intelligence (AI), a granular picture of the types of construction, topographical features, size and use of neighborhood buildings can be determined. And from that data set, buildings particularly susceptible to seismic, wind-driven or flood-borne risk can be identified. World Bank officials say machine learning and geospatial technology will play a big part in bringing retrofit and other housing resilience programs to scale around the world. The GPRH program marks an effort to coordinate global policy to improve existing housing through bottom-up strengthening measures, access to financing, and the use of advanced technologies. These techniques, pioneered by Build Change with support from its partners and funders, have proven effective in bringing resilience to communities in the part of major storms or situated in regions prone to earthquakes, climate stress, powerful storms or other natural disasters. Build Change has been working to deliver safe, sustainable housing to regions of the developing world affected by hurricanes, earthquakes, and other natural disasters since its founding in 2004. The organization’s work has won awards and support from a wide range of donors. More importantly, our work has changed the lives of tens of thousands in Colombia, Indonesia, the Philippines, China, and Nepal by rebuilding and/or retrofitted thousands of homes to modern, resilient standards designed to survive future stress. 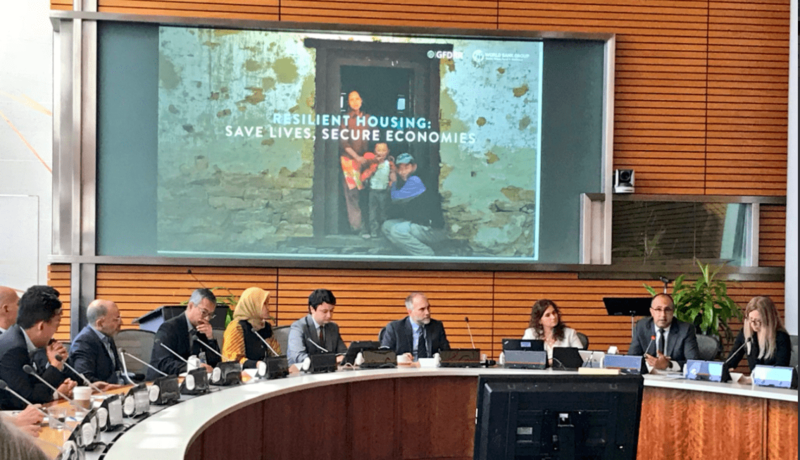 Build Change and the World Bank are launching a new initiative, the Global Program for Resilient Housing, aimed at formalizing global development approaches to providing safe, sustainable housing in regions prone to climate stress and natural disasters. The new program will be officially announced at an event held at the World Bank headquarters in Washington, D.C. on October 3 that will include a presentation by Build Change CEO Elizabeth Hausler on the potential for huge impact if governments invest more in retrofitting and prioritizing improvements aimed at improving the survivability of structures during extreme events. World Bank officials have said the initiative will leverage machine learning and geospatial technology to inform policy actions in the developing world. The World Bank, which aims to reduce poverty and the ill effects it has on people worldwide, also hopes the program will help its staff and partners to develop a pipeline of new projects that increase the resilience of the existing housing stock against both natural disasters and climate change related events. The new program marks an effort to coordinate global development policy aimed at improving existing housing through bottom-up strengthening measures, access to financing, and use of advanced technologies. These techniques, pioneered by Build Change with support from its partners and funders, have proven effective in bringing resilience to communities in the path of major storms or situated in regions prone to earthquakes, climate effects, or other natural disasters. Build Change has been working to deliver safe, sustainable housing to regions of the developing world affected by hurricanes, earthquakes, and other natural disasters since its founding in 2004. The organization’s work has won awards and support from a wide range of donors. More importantly, Build Change has changed the lives of tens of thousands in Colombia, Indonesia, the Philippines, China, and Nepal by rebuilding and/or retrofitting thousands of homes to modern, resilient standards designed to survive future stress.